The first generation Hizen Munetsugu (肥前宗次) was originally called Sakai Mitsuemon or Sakai Sanuemon (境三右衛門). His first residence was in Nagase in Saga-gun. He later moved to the castle town of Saga. He and his family were priests for the Tenman-gu Shinto shrine in Nagase. They made swords in their spare time. Since Nagase was within the territory of the Ryûzôji Daimyo family, the Munetsugu (宗次) smiths were retainers and occasionally took part in the Ryûzôji’s battles. During the twelfth year of Tenshô (1584) Munetsugu (宗次) succeeded to the head of the family and as such he also became the head priest of the Tenman-gu shrine. In the eleventh year of Keichô (1606) Munetsugu (宗次) received the title of “Iyo no Jô” (伊予掾) and in 1608 he was appointed Jô Tsuka-no-Kashira. Jô Tsuka-no-Kashira is the person in charge of all of the Hizen smiths. This would theoretically put him above Tadayoshi I (忠吉) who was in charge of all of the Hashimoto smiths. In fact it is thought that the first generation Tadayoshi (忠吉) studied under the shodai Munetsugu (宗次) in his early career (before he went to Kyoto to study with Umetada Myôju (埋忠明壽)). Very early works by the first Tadayoshi (忠吉) closely resemble works by Munetsugu (宗次) and are very different from the later style that he developed after studying with Myôju (明壽). 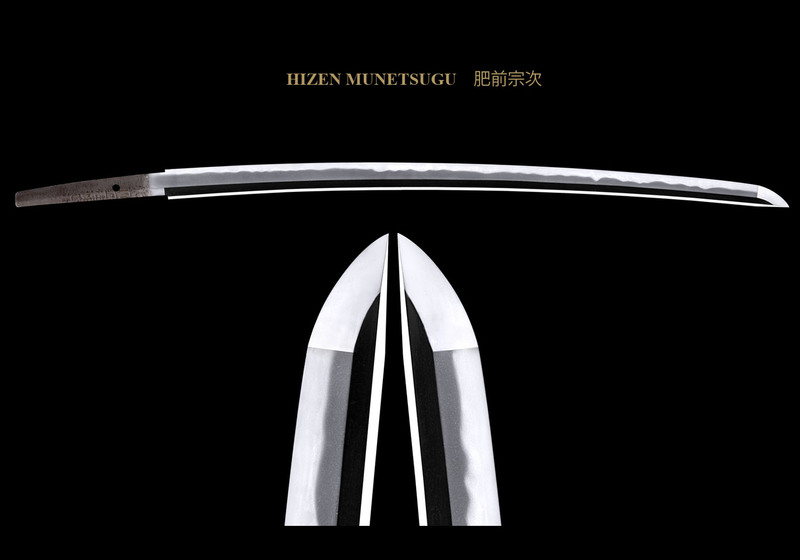 As with many sword smiths of the early Shinto period, it appears that Munetsugu (宗次) carried out a lot of experimentation, producing blades in Bizen, Soshu (Shizu style), and Yamashiro styles. He was a very good smith and is rated as Jo-saku. A number of his Bizen and Soshu blades are extant. There is a theory that not many of his Yamashiro blades survived because they were of such quality that sword dealers of his time shortened them and sold them as Rai and Enju works. Around 1608 Tadayoshi I (忠吉) and Shodai Munetsugu (宗次) both moved from Nagase to Saga city as the Nabeshima Daimyo wanted direct control over the smithies. Tadayoshi (忠吉) was then declared to be the head of the Hashimoto smiths and sought to separate his style of sword making into what we today call Hizen swords emulating Koto Rai and Enju blades of the Yamashiro school. Munetsugu (宗次) continued to focus on a totally different style of workmanship closely resembling the works of the Yamato and Soshu (Shizu) styles. Thus during the early days of the Tokugawa Shogunate there were two established Hizen smithies, starting with the original under the priest-sword smith Munetsugu (宗次) who was a retainer of the Ryuzoji family. His former best student, Tadayoshi (忠吉), then branched off under the Nabeshima Daimyo creating the Yamashiro based style we know today while the Munetsugu (宗次) line continued along its original lines of primarily Yamato and Shizu style blades. When the Shodai Munetsugu (宗次) moved from Nagase to Saga city, he received from the Daimyo a “gomen-yashiki” which is a free residence. In addition a branch of the Nagase Tenman-gû shrine was established near his residence. This area is now Nagase-cho. He died around the ninth year of Kanei (1632). The second generation Munetsugu (二代宗次) was known as Rinjuro (林十郎) and later as Kura-no-jo (内蔵丞). During the ninth year of Kanei (1632) he received the name Muneyasu (宗安) from the lord of the fief, Nabeshima Katsushige, and he later changed it to Masatsugu (正次). Subsequently he succeeded to the Munetsugu (宗次) name and received the title of “Iyo-no-Jo” (伊予掾) like his father. An interesting side note is that he never “officially” received this title. Thus he only used it on occasion. There is a sword by the second generation that is signed, “Iemitsu Shogun rakuchu Naha Soten ni gin gosen ganme o tamawaru o motte Iyo no Jô Minamoto Munetsugu ni motomete kore o tsukuru (家光将軍洛中賜五千貫目賜以銀依那波宗旦 伊予掾宗次作是). Kanei juichi-nen shichi-gatsu kichinichi”(寛永十一年七月吉日). On an auspicious day in July of the eleventh year of Kanei (1634) this was made by Munetsugu as the request of Naha Soten in gratitude to Shogun Iemitsu by using part of the funds from his gift of 5,000 kan of silver to the city of Kyoto. 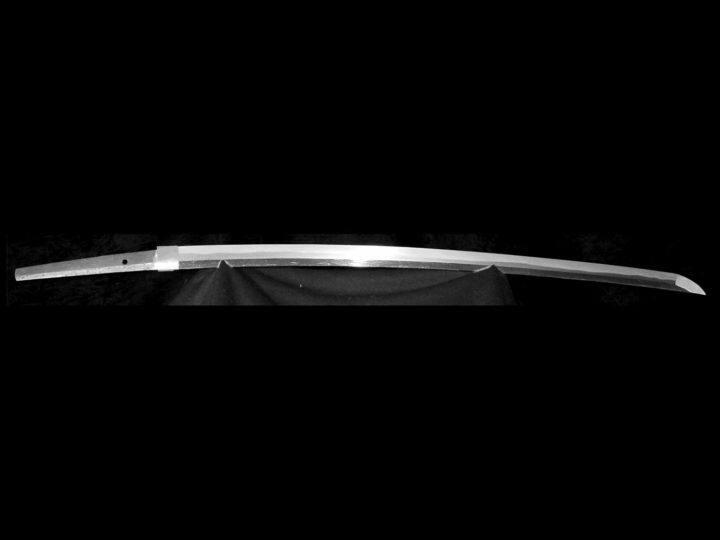 The story behind this blade is that the sandai Shogun Iemitsu visited Kyoto and bestowed upon the city the sum of 5,000 silver kan to be distributed to every citizen. At the time there were 35, 419 households so this amounted to each household receiving 114 sen and 2 bu of silver, a significant sum. In gratitude Naha Soten asked Munetsugu (宗次) to make a sword as a thank you gift for the Shogun. Thus was created this sword that turned out to be his greatest masterpiece. There is also a story in the Hagakure (The Book of the Samurai, c. 1716) about a daisho of swords made by the Nidai Munetsugu (宗次). It is a complicated story of revenge taken by Denko who was the chief priest of Ryûun-ji in the castle town of Saga. It seems his mother and his nephew leaving a temple when the nephew accidentally stepped on the foot of a Samurai named Nakajima Gourôuemon, a retainer of Taku Mimasaka no Kami Shigetoki. For this insult Nakajima Gourôuemon cut down both the grandmother and the nephew of Denko. Hearing about this, Denko’s younger brother went to Gourôuemon’s house and cut him down. Shortly thereafter, the younger brother of Gourôuemon whose name was Chûzôbô who lived with Gourôuemon rushed in and cut down Denko’s younger brother. Hearing about this further tragedy, Denko was enraged that three of his family were lost compared of only one person on the other side. He decided to take matters into his own hands. 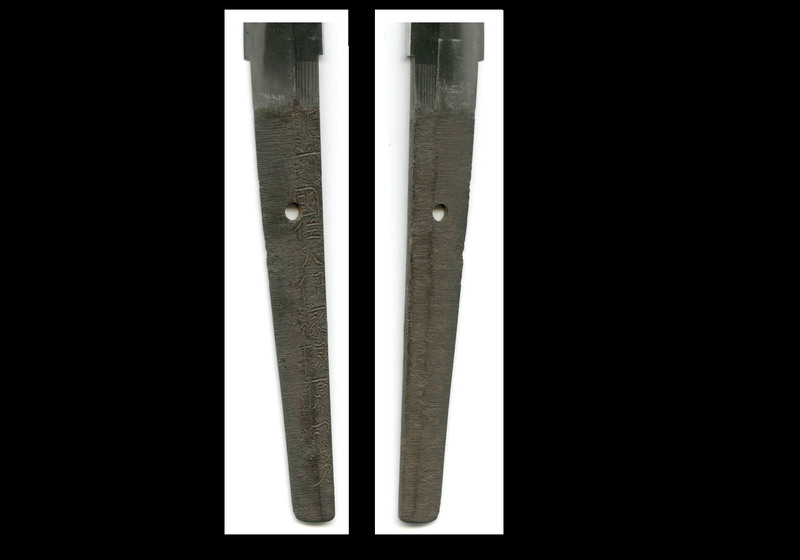 At this time, the swords of Iyo no Jô Munetsugu (伊予掾 宗次) had a reputation for cutting well so he requested that Munetsugu (宗次) make him a daisho. He told Munetsugu (宗次) that he wanted to present them to one of his calligraphy students. Denko took the daisho and went looking for Chûzôbô to seek revenge. Unable to find Chûzôbô, he decided to attack Chûzôbô’s father, Moan, who was a close retainer and companion of the Taku daimyo Shigetaki. He succeeded in killing the father of his enemies but, in doing so, he incurred the wrath of the daimyo that ordered his execution. The head priest of Kôden-ji, Tannen, who was the superior of Denko, told the daimyo that he would see that proper punishment was carried out. He also pointed out that execution was not appropriate, but that Buddhist law dictated that any priest guilty of breaking one of the five commandments of Buddhism was subject to being stripped of his robes and expelled. Thus such punishment was handed down to Denko and his life was spared. As for the swords that were used, Denko discarded them, but since it was known that they were used in this vendetta, Munetsugu’s (宗次) fame became even greater. The Munetsugu (宗次) lineage continued through successive generations into the Shinshinto era. SUGATA: The first generation was active between the Keicho and Kan-ei eras. 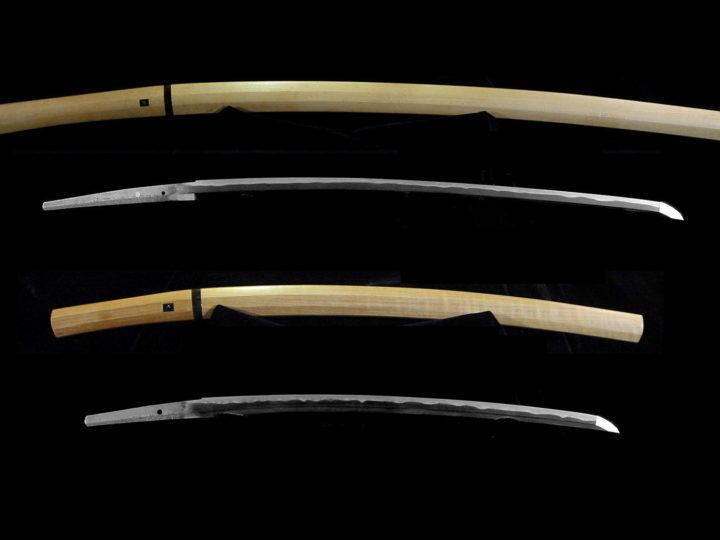 Early blades had the distinctive Keicho-shinto sugata with a wide mihaba, shallow sori and extended kissaki. Later blades and those made by successive generations had more of what we call a “normal” Shinto shape. The blade became slightly narrower with more sori and an extended kissaki. JITETSU: Since the shodai Munetsugu and successive generations made blades in a variety of styles, we find variations in the jitetsu. 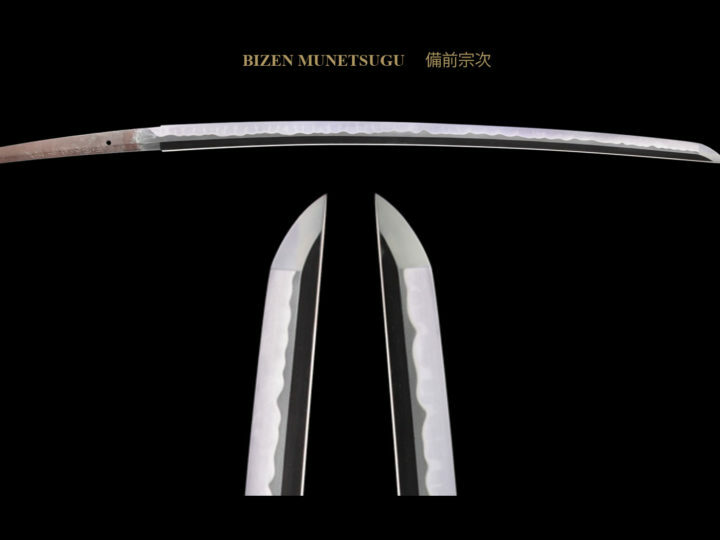 Most common, however, were blades showing Soshu or, more particularly, Shizu characteristics. These would have itame hada mixed with nagare-hada together with chikei and jifu. HAMON: The hamon tends to be wide gunome-midare mixed with ko-notare with areas of togari-ba. There will be thick nie grains covering the habuchi especially in the valleys of the tempering. This is a trait that is common to all Hizen blades and an important kantei point. Ashi, yo, sunagashi, yubashiri, and muneyaki can also often be found. BÔSHI: Usually a vigorous midare-komi with many having hakikake. NAKAGO: The nakago of the Shodai are unique in that there is a sharp tapering forming a tanago-bara (fish belly) shape used by the Soshu school. This feature disappears in the later generations. 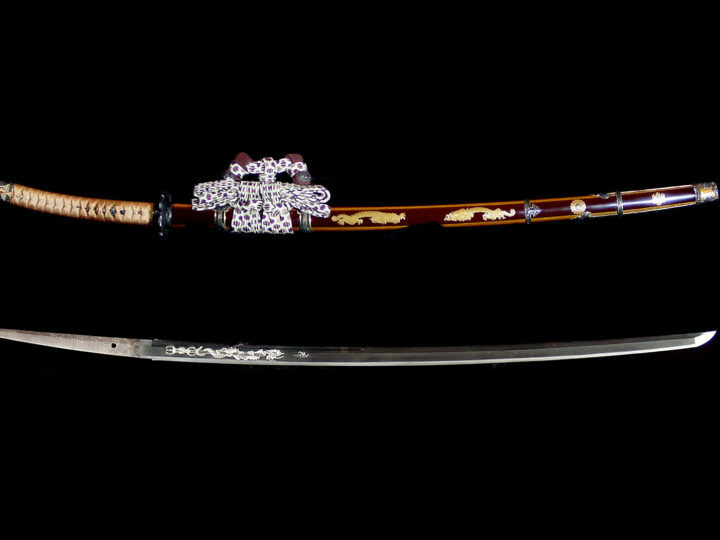 MEI: Unlike the Tadayoshi school, the Munetsugu school signed katana-mei. Their signature had a soft cursive element making it graceful. The Shodai and the Nidai wrote the character “kuni” differently and this helps to distinguish between the two generations.